Rooms for any event or meeting! Briggs Woods Conference Center will seat up to 400 guests with the option of three break out rooms and a board room. We are equipped with a sophisticated audio/visual system including audio/visual conferencing and all amenities to help your event run smoothly. To assist in planning your event, click on this helpful planning guide. To see possible set up examples, click here. 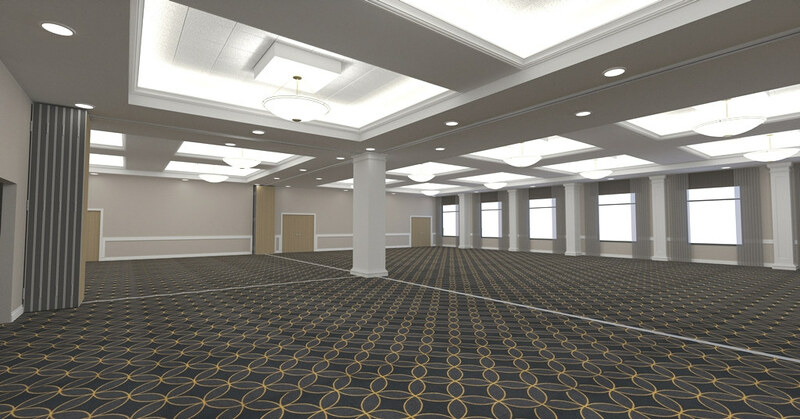 The First State Bank Grand Ball Room is our largest event and meeting space. At 5,825 square feet, the spacious Ball Room is ideal for conferences, meetings, large private events, trade shows, presentations and any other type of event needed. The First State Bank Grand Ball Room overlooks Briggs Woods Golf Course and the outdoor gardens area. The entrance to the Ballroom is located off of the Webster City Custom Meats Lobby with ample registration and display areas. The Ballroom has an exit to the Outdoor Gardens Area. *Capacity dependent on layout specifications and additions to the room. See room additions. Overlooking the Golf Course and Gardens Area, The Van Diest Supply Company Meeting Room boasts 2,825 square feet of beautiful event and meeting space. The entrance to the meeting room is located off of the Webster City Custom Meats Lobby with ample registration and display areas. The room has a private exit to the Outdoor Gardens Area. The Dean & Adele Bowden Meeting Room at 960 square feet, is perfect for smaller meetings or break-off sessions. This room has two entrances from both the Webster City Custom Meats Lobby and the front gathering area, and a shared registration/gathering area with the Prairie Room. Like the Dean & Adele Bowden Meeting Room, the Prairie Meeting Room is perfect for smaller to mid size meetings. This room at 1,390 square feet has an entrance from the front registration/gathering area and a private exit to the Outdoor Gardens Area. This exceptional meeting space is ideal for seating of up to 35 attendees or for smaller groups in alternate seating configurations. At 650 square feet, this room has an entrance off of the Webster City Custom Meats Lobby with ample registration and display areas. This meeting room is located next door and is ideal for small groups and breakout room.